I can still hear her voice—confident, clear and a little plummy. 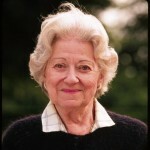 After all, by that time, in 1989, she was 79 years old and had been through a lot. In fact, she’d been through more than anyone could possibly suspect, looking at the little old white-haired lady in a lovely print dress. She might have been anyone’s grandmother, but she was also much more than that. She was a genuine American heroine. I first heard about Virginia d’Albert-Lake while watching ABC news in New York one night. I jumped up—literally—when I saw a story about an American woman who was being given the Légion d’Honneur, France’s highest award. 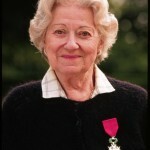 She was being cited for her heroism during World War II, when she worked for the French Resistance. I knew it was an important story and I wanted to do it, so I looked up her number and called her in France. “When do you want to come over?” she asked me, a few minutes into our conversation. I didn’t want to miss the incredible opportunity, so a week later I drove up to her house in Brittany and began interviewing the most remarkable person I’ve ever met. Virginia Roush, a young schoolteacher from Florida, was traveling in France in 1936 when she met and fell in love with the dashing Philippe d’Albert-Lake. He was a travel agent, the son of an English mother and a French father; the family had means, with two apartments in Paris and another home in Brittany. Virginia had always had a long-distance love affair with France, and after meeting Philippe, it became more than that. 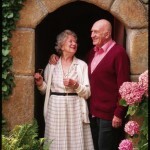 They were married in 1937 and quickly took up residence in one of the family’s Paris apartments. It was an idyllic life in many ways. She was entranced with all things French, and he was enchanted by his spunky, outspoken American bride. In time they would buy a small cottage in Nesles, north of Paris, that they used for occasional getaways. But as the decade ended, it became clear that war would come to Europe. When it did in 1939, Poland was overrun by the Nazi blitzkrieg, and in 1940 France surrendered. Philippe was demobilized from the French army, and although France was occupied by the Germans, he and Virginia tried to resume their pleasant lifestyle by staying out of the way of the occupiers. It worked for a while, but not for long. 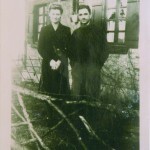 In 1943, with food, gas and other shortages becoming ever more critical, Virginia and Philippe found themselves spending even more time at their small cottage in Nesles. One day, the local baker asked them to come to his shop to meet some strangers, who turned out to be several downed American pilots. The baker was hiding them until he could arrange for their safe passage out of France to Spain, then back to England. He asked Philippe and Virginia to help. Philippe had repeatedly urged Virginia to return to her family and the relative safety of the United States for the duration of the war. But she had adamantly refused, saying that her life was with him in France, no matter what the circumstances. Now, looking at the faces of the young pilots, they felt they had no choice but to help, despite the risks. They agreed, and in so doing they joined the Comet line, a part of the Resistance that ferried downed pilots out of France and back to England, so they would be able to fly again. With that decision, their lives changed irrevocably. It was very dangerous work, especially for an American woman living under the noses of the Nazis in France. But Virginia, by all accounts, was fearless. She would even take the pilots out for walks around occupied Paris, thinking that they would go stir crazy cooped up in her apartment for weeks on end. She was not afraid of taking risks, having already taken the biggest risk of her life by choosing to remain with Philippe throughout the war. One of her jobs was to quiz the pilots who came through. The Comet line was large and occasionally broken, and the results could be disastrous: Men who were caught were shot on the spot and women often sent to concentration camps in Germany. Moreover, many Germans posing as Allied pilots had attended US, Canadian or British schools before the war, so their English was impeccable. It was up to Virginia especially, as an American, to quiz every pilot who was brought in, to determine if they were who they said they were. She had a list of questions, ranging from “Who was Babe Ruth?” or “What is a grouper?” (answer: group captain) to “What is two bits?” (25 cents) that was specific to American, Canadian or British culture. When a spy was uncovered, she would turn him over to other Resistance fighters, and the results were not always pretty. 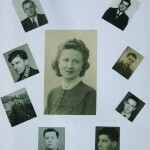 This pattern continued until the spring of 1944: Virginia and Philippe would meet the disguised airmen at various Paris train stations, hide them in their apartment and then guide them out of Paris to a halfway camp in southern France where the pilots waited to be taken to Spain and back to the safety of the UK. It was exhausting, but exhilarating work: At last, Virginia and Philippe were doing their part to help defeat the Germans. Despite the increasingly grim conditions in Paris under the Germans, there were lighter moments too, when Virginia could forget about the war for a while. For one thing, the American pilots coming through had news of the US that Virginia was eager to hear. And once, when hiding some airmen, one of them taught her the latest dance craze back in the States—the jitterbug, which led to a joyous round of dancing in the apartment. Then came D-Day, June 6, 1944. 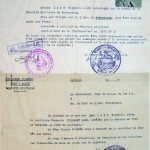 Word arrived from Belgium, the headquarters of the Comet line, that every Allied pilot in Paris should be immediately evacuated to the halfway camp, since it was feared that the Germans would begin a reign of terror and destruction once the Allies started advancing from the beaches of Normandy. With a group of airmen in tow, they took the train south, but since many of the tracks had been bombed out, they were forced to go part of the way on foot and part by any other means they could find, including oxcart. It was while bicycling with one of those oxcarts near the town of Châteaudun that Virginia was caught. She had been scouting ahead on the bike to see if the village was occupied by Germans when a German police car appeared suddenly and pulled her aside. Virginia was asked to empty her pocketbook, and out fell a list of friendly Resistance fighters along the route. Virginia had broken a cardinal rule of the Resistance—in her haste to leave Paris, she had forgotten to memorize the list and destroy it. Inexplicably, miraculously, the driver of the German police car handed the list back to her and told her to get in the back seat. When Virginia arrived at German headquarters for questioning, the interrogator immediately asked to see the list. “What list?” she asked innocently. “The list,” insisted the German officer getting more agitated. Virginia continued to express ignorance until the interrogator, emptying her pocketbook, saw a small fragment of paper fall out—all that was left. “You ate the list,” he said to her. “Yes,” she said, “I did.” While she was being driven to the Gestapo headquarters, she had reached into her handbag, torn up the list and eaten it, piece by piece, although her mouth was dry from fear. “You will be shot in the morning,” said the interrogator, and Virginia was taken off to a jail cell. Meanwhile, back on the road, Philippe and the airmen, who had seen the car stop Virginia’s bike, decided to flee on foot. Not long after they arrived at the halfway camp, but there was no word of Virginia’s fate. They knew that if she had talked, giving away the workings of the Comet line, they would all be captured or killed. If the Germans didn’t appear on their doorstep, they would know that she hadn’t talked—but they wouldn’t know if she was alive or dead. The Germans never appeared. And instead of being executed, Virginia was sent to a series of prisons near Paris and then, ten days before the liberation of Paris on August 25, 1944, she was loaded into a box car and sent to Germany, where she spent the last 11 months of the war in a series of concentration camps, including the infamous Ravensbrück, where she was nearly worked to death. Forced to help build a runway for Luftwaffe planes in the dead of winter, with snow piling up in sub-freezing temperatures, all the women had to wear were their flimsy cotton dresses and, if they were lucky, tattered coats. They were forced to stand at attention for hours in the freezing cold. Some women literally dropped dead in the snow. 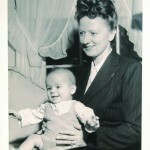 When she was released in May 1945, Virginia weighed only 76 pounds. But the war sometimes did come back to haunt her. Patrick remembers that in the late 1970s or early 1980s his mother went back to Ravensbrück with some other former Resistance fighters, and she later said that the trip was a mistake. “She was shaken by the experience,” he says. After the war, Philippe briefly worked as an antiques dealer, but as they both got older, he and Virginia moved permanently to a small cottage on the family estate in Brittany. Although they never worked together, Virginia had her own business buying antique dolls to sell to the United States. Patrick remembers that over the years many of the airmen Virginia had rescued came to visit, often bringing their wives and children. Virginia died in 1997, and Philippe three years later, his long nights without her finally over. They are buried together in a cemetery in Dinard, in a section reserved for Anglo-American citizens. So I can still hear her voice, even to this day. One thing she told me still gives me the shivers. When we first spoke, to arrange for my initial interview with her, I asked her an obvious question: “How did you survive in the concentration camps?” I asked. “It was a question of will,” she said. “You could never give in. The women who cried at night were usually dead in the morning.” Virginia never gave in. 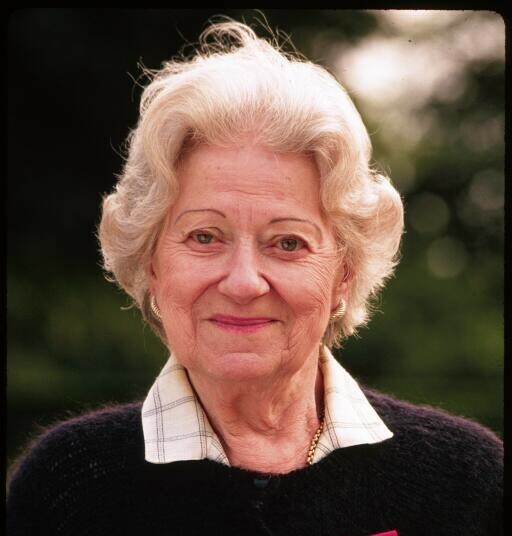 An American Heroine in the French Resistance: the Diary and Memoir of Virginia d’Albert-Lake, edited by historian Judy Barrett Litoff, was published by Fordham University Press in 2006. The paperback edition was released in 2008. Originally published in the June 2009 issue of France Today.